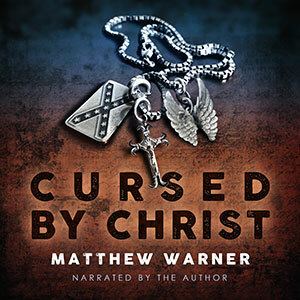 The Horror Fiction Review’s new issue calls Cursed by Christ “a good … Read more. Cursed by Christ began life as part of a much longer novel I wrote in my twenties titled Root of Evil. Although I finished that book in 2002 after ten years of labor, its device of the magical old black man, which I’d subconsciously borrowed from Stephen King’s The Shining, wore thin. Not to mention I couldn’t sell it. At 213,000 words long, I couldn’t cram it into a market asking for 70,000–100,000 word long books, and my attempt to divide it into a two-part series (The Knowing, ending in a cliffhanger, followed by Revelation) didn’t work, either. Of course, let’s be honest here. Maybe it didn’t sell because it was my first novel—or first two novels, as it were—and so it wasn’t all that good. But at least Root of Evil and all the short stories I wrote during that time functioned as a self-taught graduate course in writing. When my subsequently written “first” novel, The Organ Donor, came out in 2002, reviewers remarked that I wrote as if I already had some titles under my belt. The 1860s backstory of the antagonist, Alice Norwick, eventually won me over. I’d written it as a major subplot that the main character experiences in a virtual reality-like telepathic immersion in Alice’s memories. I realized Alice wasn’t such a bad person after all. Deluded, maybe, but not evil. So I did some major surgery—a ploterectomy—to remove her history from the surrounding novel and craft a new ending so she could achieve peace. I titled the new manuscript Cursed by Christ. It went out the door in 2002 and within three years had three courtships with small press publishers. Each potential contract fell through for different reasons. One editor requested major rewrites that I wouldn’t agree to (what if you made it all about voodoo? ), and another went out of business. The third deal imploded because I couldn’t abide that the company had published another writer everyone hated. Yeah, really. Does that sound like me now? I was afraid of guilt by association or some such crap. I also worried about offending people with my title. Writers may brag about the attention of being banned by a library, but I doubt anyone actually wants it to happen. So I retitled it to The Dagger of God—and started piling up rejections out of hand. By 2013, I finally threw in the towel and decided it would never see print. A portion did get published, however, as a 10,000-word short story called “Angel’s Wings,” about Alice’s time in South Carolina. Apartment 42 Publications printed it in Tales from the Gorezone (2004), edited by Kealan Patrick-Burke. I later put it in my first short story collection, Death Sentences: Tales of Punishment & Revenge (2005). So all hope wasn’t lost. As other writers might observe, there’s no wasted effort. Manuscripts can decay into compost to nourish the growth of new tales. Still, some of the story’s images haunted me. I thought about the Civil War, the Reconstruction, and the origins of the KKK. I thought about the lies we tell ourselves and that others tell us. I thought about the present. Racism remains alive and well in America. Klansmen march, and Rebel flags wave. African Americans and American women of all stripes might no longer be considered property, but they continue to be marginalized in various ways. And let’s not forget about mental illness, which isn’t going away any time soon. So a story like this, I feel, is relevant. It should shock and offend you on some level. I’ve given up my worries about that during this long journey and have restored the original title.